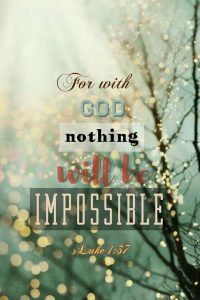 Truth Tuesday – Nothing Is Impossible for God! If you find yourself waiting for God to answer something you have been praying about, I hope that today’s Christmas devotional will encourage your heart. Begin by reading the scripture. 5 In the days of Herod, king of Judea, there was a priest named Zechariah,[a] of the division of Abijah. And he had a wife from the daughters of Aaron, and her name was Elizabeth. 6 And they were both righteous before God, walking blamelessly in all the commandments and statutes of the Lord. 7 But they had no child, because Elizabeth was barren, and both were advanced in years. From the time Zechariah and Elizabeth were married, I imagine their hearts longed and prayed for a child, but year after year no child came and Elizabeth faced a culture that treated her as if she was an embarrassment and disgrace. Yet, scripture tells us they continued to pray and wait for God to answer. I’m sure both of them questioned the delay in their prayer being answered, just as we often do. The wait that Zechariah and Elizabeth experienced brought about an incredible answer to prayer. One that must have been beyond anything they could imagine! 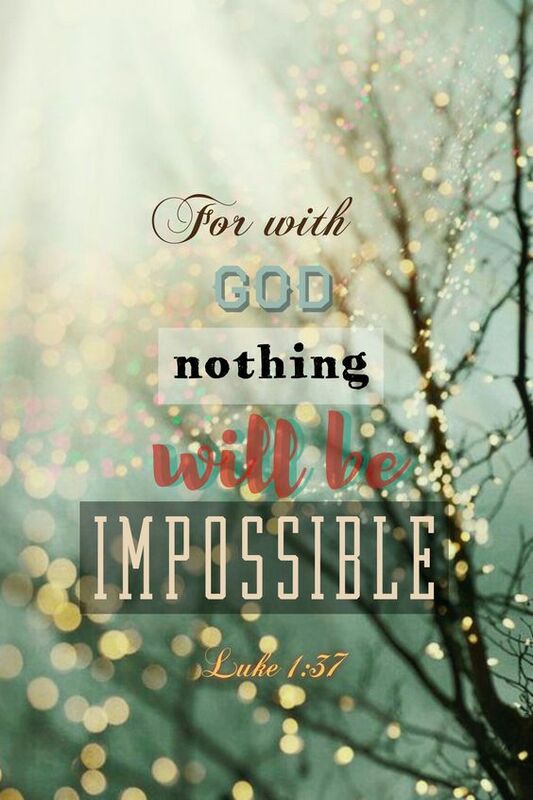 As I write this, these words come to my mind….BUT with God nothing is impossible! Do you have concerns that grip you and cause you to feel afraid and even doubt that God is able fix a circumstance or resolve a difficult situation you are facing? Perhaps you feel that it seems hopeless and out of God’s ability to handle. Maybe it is something that you have been praying about for a very long time and haven’t seen God answer or change and you are doubting that He will. Dear friend, God is the same today as He was when this story took place a very long time ago. He can solve any concern or problem you and I have in our lives. You may not be able to see what He is doing, but He is at work! Read these verses over and over a few times. As you do, name your situation and simply surrender it over to the One who is working it out for your good and for His glory. God sees beyond the realm of your sight…your thoughts…your desires…your imaginations. He operates Exceedingly. He operates Abundantly. He operates Beyond. He is always working out a miracle that transcends the farthest reaches of our thoughts…and all for His glory. He may not be answering your prayers right now. But this I know to be true and believe – He is orchestrating His plan and purposes for us and will unfold it in His timing. So in the meantime…May I encourage you and I to do this… Wait. Pray. Hope. And get ready to do what Elizabeth did – give God the glory. …And while you wait, let me also encourage you look for things daily where you say with great confidence and with heartfelt thankfulness, “God did this for me.” It makes the wait just a little sweeter!